Bristol-Myers Squibb might have fast-growing cancer drug Opdivo, but here's why Pfizer is the better dividend stock. Big pharma stocks have been popular among investors seeking solid dividends for a long time. And for good reason: Large drugmakers historically have generated such tremendous cash flow and earnings that they have been able to reward shareholders with juicy dividends. Bristol-Myers Squibb (NYSE:BMY) and Pfizer (NYSE:PFE) have been two favorite big pharma stocks for investors over the years. But Pfizer appears to be the better dividend stock now. Here are three reasons why. This one's easy. Pfizer's dividend currently yields 3.76%, while Bristol-Myers Squibb's dividend yield stands at 2.95%. Advantage: Pfizer. It hasn't always been this way, though. 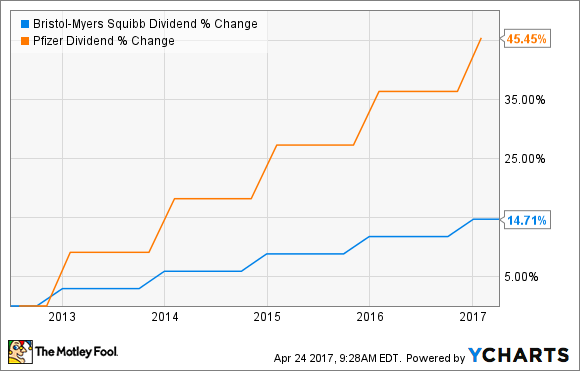 For most of the past several decades, Bristol-Myers Squibb (BMS) claimed a higher dividend yield than Pfizer did. Although BMS kept its dividend steady for several years in the early part of the 21st century, the drugmaker didn't have to slash its dividend like Pfizer did in 2009. Pfizer took the lead with a higher dividend in 2013, though, and hasn't looked back since. The company began increasing its dividend payments at a significantly faster pace than BMS. BMY Dividend data by YCharts. There's a legitimate case to be made that Pfizer's management now views its dividend program as a more important part of its overall investing thesis than Bristol-Myers Squibb's management does. Pfizer clearly has prioritized increasing its dividend more than BMS has. I suspect that Pfizer's edge in dividend yield isn't just a temporary phenomenon, but rather one that should continue for quite a while. You might compare the two pharmaceutical companies' dividend payout ratios and think that Pfizer's dividend could be in trouble. Pfizer paid out more in dividends than it earned last year. Bristol-Myers Squibb, meanwhile, used less than 58% of its earnings to fund its dividend program. However, the more important thing to look at is free cash flow. Pfizer had levered free cash flow (the amount of cash available after meeting all financial obligations) of $13 billion over the last 12 months. BMS had levered free cash flow of $2 billion. The bottom line is that Pfizer has significantly more cash to fund its dividend program than BMS does. Of course, Pfizer can't continue to spend more on dividends than it earns indefinitely. However, that shouldn't be a problem with the company's earnings on track to improve. There's one other key reason why I think Pfizer is a better dividend stock that could be easily overlooked. Bristol-Myers Squibb is much more dependent on one product than Pfizer is. That increases the risk to the company -- and therefore risk to its dividend. The extent of this issue might not be evident at first glance. Keytruda was Bristol-Myers Squibb's top-selling product in 2016, but the cancer drug only accounted for 19% of total revenue. That's not too much reliance on one product. However, the expected success of Opdivo could change the picture in the coming years. Bristol-Myers Squibb's fortunes depend heavily on Opdivo. The drugmaker does have a few other products that are growing sales solidly, but none of them have the peak sales potential that Opdivo does. Pfizer, on the other hand, has its eggs spread across many baskets. Its top-selling product, Prevnar 13, accounted for less than 11% of total revenue last year. And Pfizer is becoming less dependent on the pneumococcal vaccine with the launches of new products. If any rival to Opdivo winds up denting the expected sales growth for the drug, BMS could find itself scrambling to keep investors happy. Pfizer should be able to withstand a major challenge for one of its top drugs much more easily. Thanks in large part to anticipated success for Opdivo, Wall Street analysts think that Bristol-Myers Squibb will enjoy higher earnings growth in the coming years than Pfizer will. Analysts project that BMS will grow earnings by an average annual rate of nearly 12% compared to only 6% for Pfizer. If these projections pan out, it's possible that Bristol-Myers Squibb will use its higher earnings and cash flow to boost its dividend payments. Maybe BMS will even regain the lead over Pfizer with respect to dividend yield in a few years. However, my view is that dividend-seeking investors would be better off heeding the old adage that a bird in the hand is worth two in the bush. Pfizer is the better dividend stock now.